Masterfully Designed and custom built with numerous exclusive features . 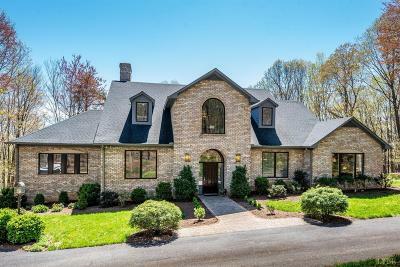 The pristine 5 BR, 4 1/2 BA home welcomes you with a gracious open foyer opening to the light filled entertaining room with milled cabinetry and warmed by the fireplace. Chefs kitchen with Thermador cooktop, stoves, microwave and built in refrigerator. Large central island. Large laundry and pantry convenient to kitchen. Master bedroom wing has it's own sitting area with fireplace, private deck and newly renovated bath and office nearby. 3 spacious BR and 2 Baths off of gracious stairway on second floor. New terrace level with game room, fireplace, full bath and exercise room. Oversized 2 car garage. 8 acres of beautiful wooded privacy for future pool and garden. Exclusive list of details available.